The impact of a terrorist attack on the BART amid an increasingly paranoid surveillance society results in the arrest of four truants for terrorism and leads to one fighting back with a little help from his friends. There are few punches pulled with the detention scenes and rightly so, their effects on Marcus, Darryl, Zeb and their families are plausible. The 'bad guys' are chillingly anonymous - even at the endgame there's no certainty of victory and along the way there are enough knocks and setbacks to make this battle a bitterly fought one for someone as young as Marcus who literally has his whole life to lose if the bad guys win - a slow death measured in decades of surveillance and social exclusion as 'one of them'. Little Brother tips it's hat to 1984 and Abbie Hoffman's 'Steal This Book' as well as Kerouac's 'On The Road' and Allan Ginsburg's 'Howl' -Doctorow is a trend watcher par excellence when it comes to Internet culture, the rise of arphids (RFID tags) as covert surveillance tools, school netbooks pre-installed with government spyware and Harajuku Fun Madness alternate reality game mirror existing things. Those familiar with Down And Out In The Magic Kingdom will be delighted to see he's improved in leaps and bounds (and Down And Out... was good stuff) since those heady days. While a couple of characters (Charlie, M1k3y's cool Britmom) are fresh out of Central Casting, the plot is crisply logical even if the Department for Homeland Security seem toothless against the new XNet though Doctorow's portrayal of how public servants process surveillance data is chillingly accurate. The afterwords by Bruce Schneier and Andrew 'bunnie' Huang show that this rabbit hole goes deep indeed and challenges the readers to look at the world differently. It's opened my eyes - I've never seen PKI cryptography explained so clearly or so succinctly. It's like cyberpunk never died but became ubiquitous as John Lydon and Iggy Pop plan a Duranmas Duranmas advertising offensive. To say there's gaming inspiration for all kinds of modern-era games might be an understatement on a par with space is big and fire being hot. If you've lived in the shadow of the valley of the geek and you have pals who are counterculture and don't understand you (still!) then lend them this book. 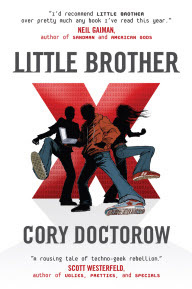 You can download Little Brother from craphound.com for free but it's good enough to pay for. If you're the kind of person who enjoys looking at the backstage notes, take a look at w1n5t0n.com, where the book is annotated.